"In 2000 I was presented with an opportunity to oversee my father's operation in South Africa. However due to prevailing business conditions at the time, the company closed down the month before I arrived. With 13 suitcases in hand, two very young children and no job I made a choice to continue on the journey to South Africa," Louisa Garland-Els explains. Garland-Els says the one advantage she had was that all the technology her father's company had learnt during their 15 years of operation was given to her. However, while she had this foundation to work from, she had no capital, no clients, no friends, and no knowledge of this business, nor how businesses worked in South Africa. "The only thing I did have was the belief I had in myself to succeed and my passion," said Garland-Els. I needed to provide for and support my young family. And so Imperial Armour was born. "During the first two years, I received no orders and yet my knowledge grew and I was able to have the body armour and ballistic helmets internationally tested. It was a slow and expensive but necessary process," she explains. 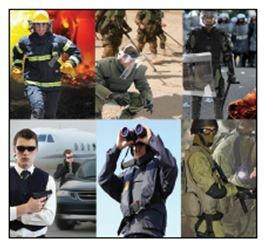 Imperial Armour's core focus is to manufacture and supply personal protection to all sectors including military, security, police, fire, emergency services, VIP, demining and special operations. The company is able to provide a large range of sophisticated products and pride themselves in being the one stop company for personal protection. In addition to the head office in Durban, Imperial Armour has branches in Johannesburg, Cape Town as well as Dubai UAE, with plans to expand further. "My long term goal is to establish branches in SADEC countries as well as growing further our international business. This will be effective when we have established working agents throughout the major sectors of the world," says Garland-Els. "We already have offices in Dubai and I wish to use this as our base." "My short term goal is to open branches in each port throughout South Africa. It will also be necessary to expand our factory to accommodate the anticipated growth. In fact, due to winning several large national accounts in South Africa, it is very necessary to expand at the present time! Our turn over increased by 60% in February 2015," she says. Imperial Armour has established a vast client base within South Africa servicing nationwide, Chubb, ADT, and G4S. During the last 15 years the company has received orders in more than 75 countries and has supplied the United Nations in Zambia, Nigeria, Jordan, Lebanon, and Kuwait, to name a few. Imperial Armour also supplied GHQ Armed forces in the Middle East for demining equipment for three years to the police. We manufacture according to our clients' needs. It is essential to know for which operation the products are needed, whether it's for the military or the police etc. We need to know if it is for a covert or overt operations and what the threat levels are, for example if the threat is against bullets and / or fragments. We need to also take into account the environment, and / or whether UV protection and chemical protection as required. Another factor is whether it is required to be lightweight or not. Obviously there is a cost implication with this. It is very important to work closely with our clients. 77% of our orders are repeat orders and this is because we offer an excellent service, superior quality and we are able to customise. Imperial Armour has developed stringent in-house quality standards adhering to ISO 9001:2008, to ensure that only top quality products are provided. Designs utilise cutting edge materials and are manufactured to maximise comfort and agility without compromising safety. All products are rigorously tested and certified to international ballistic standards. Garland-Els explain that products have to be of the highest of standards as it is a matter of life and death. "During our last two ISO audits, there were no findings. We have also received 100% for our latest SABS audit and are an accredited supplier to Armscor," she says. "In furtherance of our commitment to achieve a sustainable green work place, we practice stringent waste management, recycling and a paperless work environment." For the last six years Imperial Armour has received the Exporters' award for KZN. Recently the company has been named as a finalist for the top manufacturing company in KZN, as well as top brand. Additionally, Garland-Els was also nominated as a finalist for the top individual female entrepreneur in South Africa for 2015. Her core beliefs as a woman in business can be summed up in three words: innovation, empowerment and commitment to excellence. In 2016 we have started our uniform company and have already secured a large order. This will also lead to employment of more staff. Marketing is an extremely important part of our business and as of 1st August we launch our buy on line website. "As a woman in business in South Africa, I believe that we have an obligation to mentor and develop future women business leaders and to achieve this goal, my practice is to promote from within," says Garland-Els. As a measure of her commitment, 99% of her work force comprises women, the staff is made up of 63 women and two men. She is proud that Imperial Armour was given the award for the top women empowerment company in South Africa. "Mahatma Ghandi once said: "You must be the change that you wish to see in the world." This sums up my philosophy," says Garland-Els. "I strive for meaningful change, to better the lives of my workers, and ultimately to contribute to make the world a better and safer place for all." To develop and nurture our relationships with clients based on trust and integrity. To protect lives through our credibility in the expanding global market. Imperial Armour is now International!